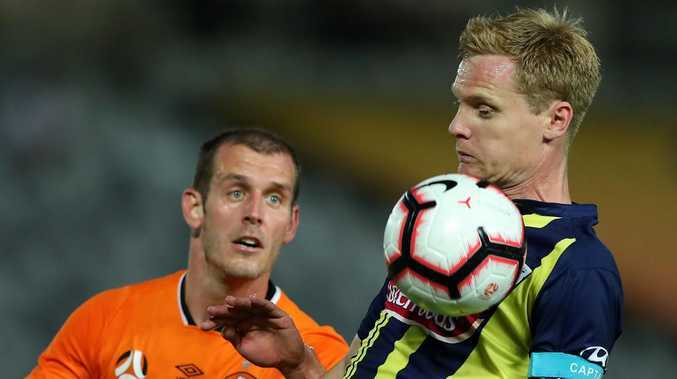 Matt Simon controls the ball during the round 14 A-League match between the Central Coast Mariners and the Brisbane Roar at Central Coast Stadium. 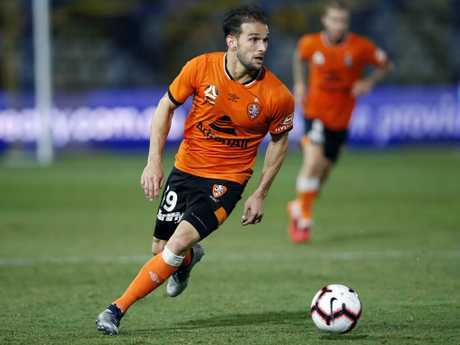 Brisbane Roar's depressing form continued on Sunday night when they drew 1-1 with Central Coast Mariners in Gosford. In a battle of the competition's two worst teams, it was the last-placed Mariners who looked the most likely to snare a win. However both sides had to settle for a point, with the Roar having now gone 10 matches without a victory. In that period, Brisbane have picked up just two points from a possible 30. It could not have been a worse start for the beleaguered Roar, with the hosts going ahead in just the third minute. Some lazy work from the out-of-form Connor O'Toole gifted the Mariners possession, with midfielder Matthew Millar pouncing to score his first A-League goal. Roar striker Adam Taggart had a great chance to equalise five minutes later but the former Perth Glory marksman could not direct his header on target. Taggart had another chance in the 29th minute when fed by Henrique, but he smashed his shot against the crossbar. However, the Roar were rewarded for a sustained period of pressure with an equaliser on the stroke of halftime. It came from an unlikely source, with forgotten defender Luke DeVere scoring his first goal since October 2016. Out of favour for almost half the season, DeVere rose high to head home an Eric Bautheac corner. It was part of an impressive performance from DeVere, who was strong in defence as the Roar withstood pressure from the Mariners in the second half. The Mariners wanted a penalty in the 72nd minute, believing Brisbane defender Daniel Bowles used his arm to control a bouncing ball. However, after checking with the video assistant referee, match referee Matthew Conger stuck with his original decision to not award a spot kick. Roar substitute Dylan Wenzel-Halls had a late chance to steal a winner for Brisbane, but Mariners goalkeeper Ben Kennedy made a smart save at his near post. "We left Brisbane (on Saturday) full of confidence about winning the game," interim Roar coach Darren Davies said. Jack Hingert takes Roar forward at Central Coast Stadium in Gosford. "We were disappointed to concede a goal so early but the for the final 15-20 minutes of the first half we were the better team. "But in the second half I don't think we were as good as we could be." Davies made five changes to team that started in their embarrassing 5-0 loss to Melbourne Victory at Suncorp Stadium last Tuesday night. Seasoned quartet Thomas Kristensen, Matt McKay, Henrique and Jack Hingert, and defender Daniel Bowles were recalled. Out went youngsters Joe Caletti, Nick D'Agostino, Dane Ingham and Stefan Nigro, and Spanish midfielder Alex Lopez, who was left in Brisbane to rest a knock he received in Brisbane's loss to the Victory. And with McKay, Bautheac and Jacob Pepper all set to miss Friday's home clash against Western Sydney Wanderers because of accumulation of yellow cards, Davies will again be forced to make changes.